Crossovers are money makers for car companies these days. Part car, part SUV, these hatchbacks are possibly the hottest segment in the automotive market today, and pretty much all manufacturers sell them. Mitsubishi has offered a crossovers for years including the Outlander and the compact Outlander Sport (or RVR in Canada). For 2018, Mitsubishi added a third CUV to its lineup, the Eclipse Cross. Mitsubishi is no stranger to AWD vehicles. Eclipse. Expo. 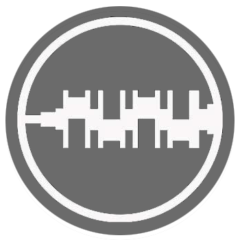 Galant. 3000GT. Endeavor. Lander. Outlander. Outlander Sport. There have been scads of AWD Mitsubishis for years. The company was also one of the early adopters of the crossover platform. 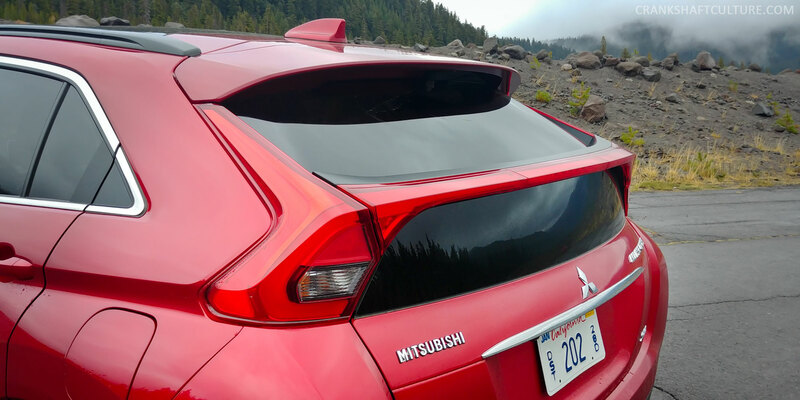 “Outlander Sport was one of the original compact CUVs and we’re very proud of the fact that we led the charge to essentially help create the category,” says Jeff Holland, Director of Public Relations & Events for Mitsubishi Motors North America. Heck, you could argue the old 1992 Expo and Expo LRV were crossovers ahead of their time. Oh, you don’t remember what they were? They looked like this. I owned one. The last several years haven’t been great for Mitsubishi, but business has picked up over the last couple years. With new models, new strategies, and the Nissan-Renault alliance, things are starting to look up. In fact, Mitsubishi sales continue to grow. Current year-to-date sales are up 21% vs. 2017, and the company had its best August in 10 years. When many companies’ sales are going down, Mitsubishi is bucking the trend. There’s been a focus on new technology, such as the Outlander PHEV; small cars, such as the frugal subcompact Mirage; and of course, crossovers. This includes the new Eclipse Cross. That name. It has Eclipse in it. Let’s just get something straight: The Eclipse Cross has nothing to do with the former Eclipse coupe offered from 1990–2011. Mitsubishi simply integrated the name of one of its best-known vehicles into this CUV, likely because people remember the Eclipse. But let’s not get hung up on the vehicle’s naming convention. Aftermarket Support (1-5): 1.5; we assume Outlander Sport suspension bits will work, but not much engine stuff yet. Spirit Animal: Golden Doodle. A crossbreed that’s versatile and intelligent. May not be the fastest or most beautiful, but is loyal, dependable, and just a bit different. Styling is, of course, subjective. That being said, I’d say the Eclipse Cross’s looks are familiar but also unique. From its chrome two-bar grille and angular lines, to it’s high-mounted taillights and two-pane rear windscreen, people aren’t going to mistake this for a Ford Escape. Personally, I like the back-end treatment and the looks of the double-panes of glass on the hatchback. Others, however, have said more unkind things, including it reminds them of a Pontiac Aztek. I can see why some people would say that, but I also think it’s a bit of a stretch. After all, that’s just one syling component. I wouldn’t say the Eclipse Cross gets my pulse racing in the looks department, but I’ve seen sleepier designs, and I like the fact that it’s a bit different. By the way, if you were wondering why someone would buy this over an Outlander Sport (especially since the Eclipse Cross is just 2″ longer), we asked Mr. Holland about this. 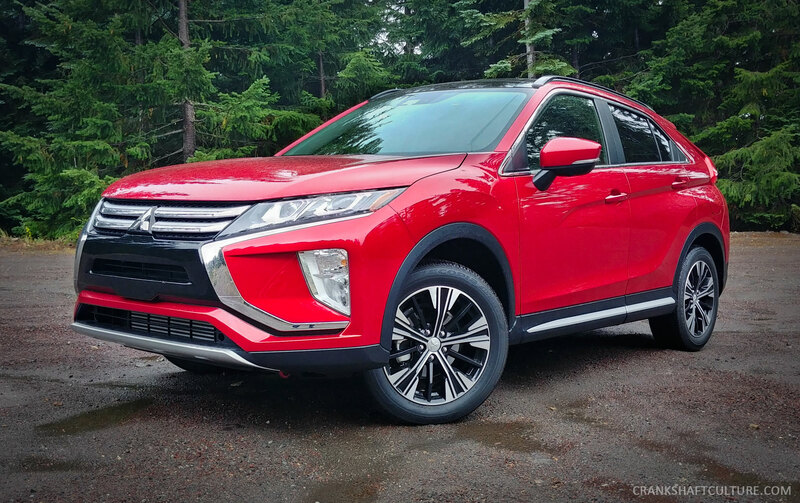 “Eclipse Cross is our newest entry in the field and is a little larger and more premium than the Outlander Sport,” he said. He went on to say that in future iterations, and once they begin the platform sharing via the Nissan-Renault Alliance, we’ll see more differentiation in sizing between the two models. You heard it here first, folks. Eclipse Cross is available with one engine, one transmission, and your choice of FWD or AWD along with various trim levels. 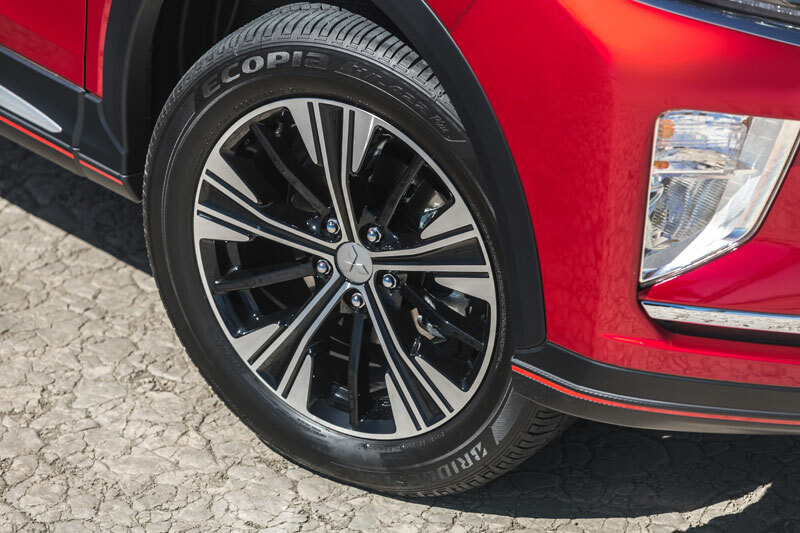 Our test model was a top-of-the-line SEL equipped with Mitsubishi’s AWC (all-wheel control) all-wheel drive system, and rolled on 18-inch alloy wheels wrapped in 225/55/18 Bridgestone Ecopia tires. All Eclipse Crosses come with the new 4B40 1.5-liter turbocharged/intercooled direct-injected four cylinder with the MIVEC variable valve timing/control system. This mill makes 152 hp and 184 lbs/ft of torque. It’s mated a CVT, which—despite not being heaps of fun—is paired well to the engine. There are paddle shifters if you find the need to shift a CVT into one of its eight “gears,” which will always be weird to me, since the whole idea of a CVT is so you don’t have to, you know, shift. (Mitsubishi is not the only manufacturer that offers this ability by the way). Yes it’s boosted, yes it’s AWD, no it’s not going to conjure up feelings of driving an Eclipse GSX or a Lancer Evo. Initial acceleration feels adequate to about 45–50 mph. Passing power leaves a bit to be desired, but the car cruises comfortably at 70+ mph, albeit with noticeable wind noise. This car could really use about 40 more horsepower. It would make it orders of magnitude more fun to drive, even with the CVT. Plus, it would put it more on par with the more powerful Kia Sportage models, Ford Escapes, and so on. By the way, there is adaptive cruise control—always a nicety. That being said, when the vehicle encountered a car and slowed down, once the lane was clear, it was was slow to come back up to speed. The car’s ride is perfectly average; handling is much the same. The all-wheel control system (with normal, snow, and gravel settings) works well when pushed, and you can feel the back-end right itself during spirited cornering. Plus, the steering is surprisingly quick and well weighted. Unfortunately, the vehicle feels more lumbering that it looks, and body roll is abundant when pushed. Like, more body roll than a CUV should have, anyhow. Suspension is composed of a MacPherson front strut system and multilink rear, so it is fully independent. I’d like to see the suspension tuning changed to add more damping during harder cornering. I know this isn’t a sports car, but even so, less body roll would be nice. I just kept thinking that this vehicle feels heavier than it is. By the way, the Eclipse Cross rides on the company’s GS platform, the same as the former Lancer, and current Outlander and Outlander Sport (as well as a host of other vehicles from the FCA family). It’s a fairly old platform. That should, however, have given Mitsubishi plenty of time to work out any bugs. I would love to see an Eclipse Cross GT or Ralliart, or something with more gusto and more handling prowess. Oh, and a manual transmission, or at least a quick-shifting dual-clutch setup. I’d have to say this is the nicest Mitsubishi interior in many years, arguably since the disappearance of the Montero or Diamate sedan. It’s comfortable, solid, and well appointed. There’s a panoramic sunroof, heated front and rear seats and a heated steering wheel, leather, an amazing 710 watt Rockford Fosgate stereo, even a heads-up display. The interior is very comfortable. I do wish the front seats had additional side bolstering, however, and all that glossy piano black plastic was already showing scratches. Why automakers insist on this finish is beyond me. Only two things struck me negatively. First, the rearward visibility takes some getting used to with that double pane of glass on the hatchback. There’s a dividing bar right in the center and that can affect views in the rearview mirror. Secondly, the infotainment system is frustrating, despite the powerful nine-speaker Rockford Fosgates stereo’s amazing sound. Initially the interface—complete with center-console-mounted touchpad— is downright maddening, but once you get used to it, it’s only mildly annoying. It could certainly be improved. Of note is the heads-up display. While hardly a revolutionary technology, I very much appreciate the fact that you can completely stow it away if you don’t want to use it, unlike some other vehicles I’ve been in. Not only that, but you can adjust the location of the info on the display as well as the brightness. Oh, you can also adjust the headlights in the same dash-mounted panel. Nice touch. The HVAC system is digital and push-button, but is easy to use. Crossovers should be practical, and the majority of this vehicle is. The steep rake on the rear windshield, however, does limit some cargo carrying ability. 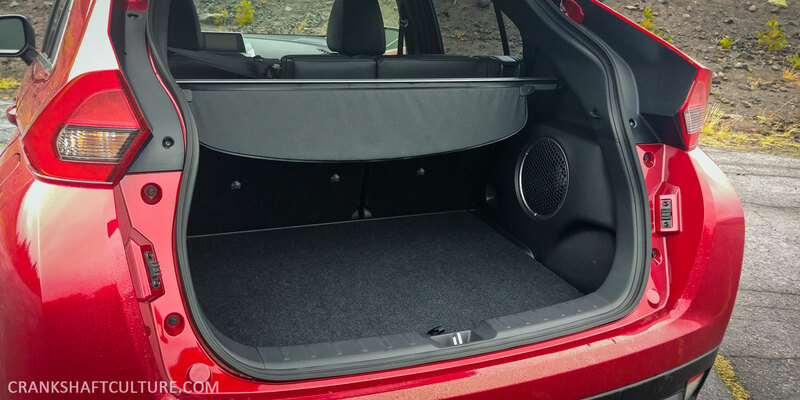 Luckily, the rear seats fold down so there’s plenty of room for most gear. This vehicle is rated at 25 city 26 highway, and 25 combined MPG—definitely on the lower end of the spectrum for small CUVs. That being said, Mitsubishi has a fantastic warranty that, in my opinion, they don’t tout enough: 5 year/60,000 miles bumper to bumper; 10 year/100,000 miles powertrain. That’s very good. I think the Eclipse Cross’s biggest asset is that it’s different. The brand is different. The car is different. It stands out more so than a Ford Escape or a Hyundai Tucson. And while it’s not as powerful or sporty, it has a lot to offer. Now we need one with more power and quicker reflexes. We know Mitsubishi has the DNA to do so. 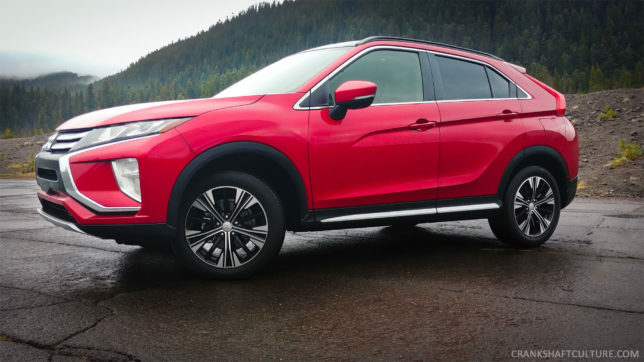 In fact, I’d go as far as to say the Eclipse Cross is Mitsubishi’s most solid car in a long time, and the automaker needs to continue to make cars of this quality. I fully expect Mitsubishi to continue to grow in the U.S. as the brand revamps its lineup, adds new dealers, and refreshes and works with its existing dealers. 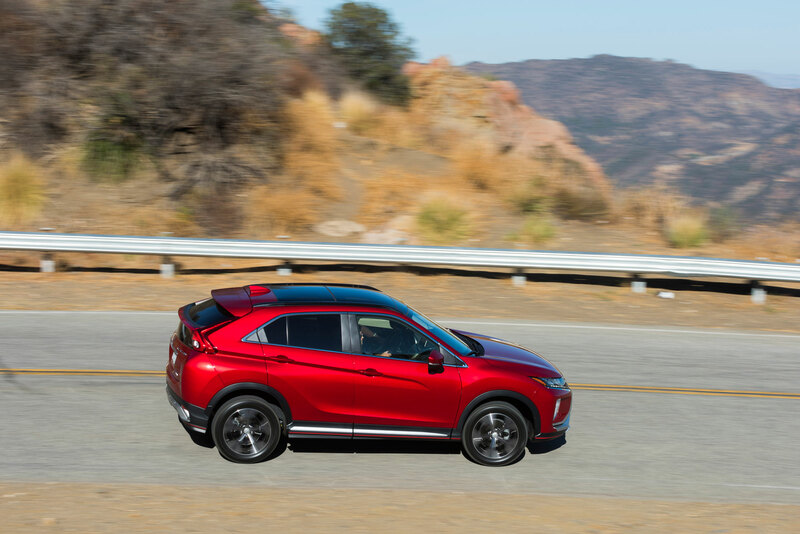 The Eclipse Cross is definitely as step in the right direction for Mitsubishi and it is a solid choice if you’re looking for something other than the same-old crossover. Pingback: Is it Time for a Crossover Racing Series?